Today is the 2nd annual Parents of Preemies Day. Knowing that I would be delivering Liam much earlier than 40 weeks made me go into a complete panic mode. I've only heard people talk about preemies and had never met a preemie or a parent of a preemie. Then when I found out I would be having a micropreemie I went into a freak out mode. What's a micropreemie? What's the difference? 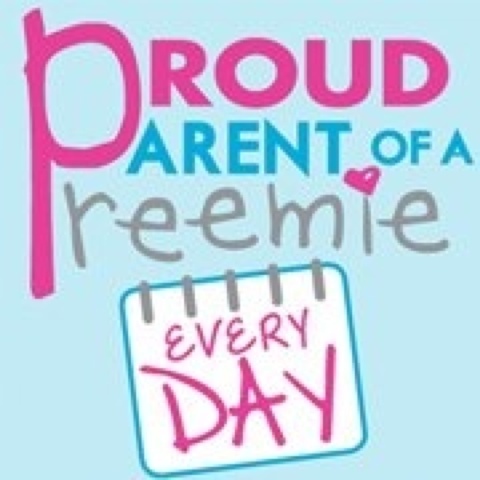 Becoming a preemie and micropreemie parent has been the toughest job I've ever had. When Liam was born I was already a mom for 3 years and had a full time job. I thought being a full time working mom was hard but I had no idea what life had in store for me. Most people think that once you are home from the NICU that your life is normal as a newborn baby but it's definitely not that easy. The difference between my 2 sons are like night in day in the way that their first year has played out and that's besides the obvious early arrival and NICU stay. With Noah we didn't have early intervention, feeding team clinics, ophthalmologist appointments, dietitian appointments, etc. the list could go on and on! I get asked frequently when will Liam be caught up and we won't have a busy schedule full of doctors appointments and therapy sessions and quite honestly, I have no idea when that will be. All that I do know is that he is doing better than anyone could have ever imagined! Is he delayed in some areas? Sure. Is he caught up in size yet? Not even close. However, he is walking and advancing every single day. He has showed my family that miracles come in teeny tiny packages and we are so happy we are able to see him flourish daily. I'm a proud preemie parent and I'm so happy to be able to celebrate today with my special micropreemie Liam! 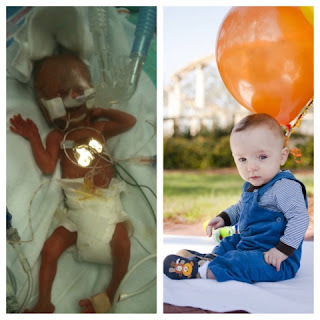 On the left is Liam the night he was born weighing 15oz in October 2011. The picture on the right is of Liam this past January. Liam and I are famous! 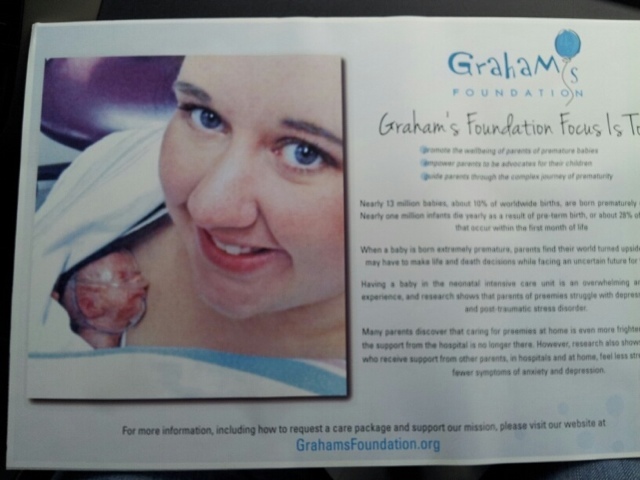 This is us at the Graham's Foundation event for Parents of Preemies Day.